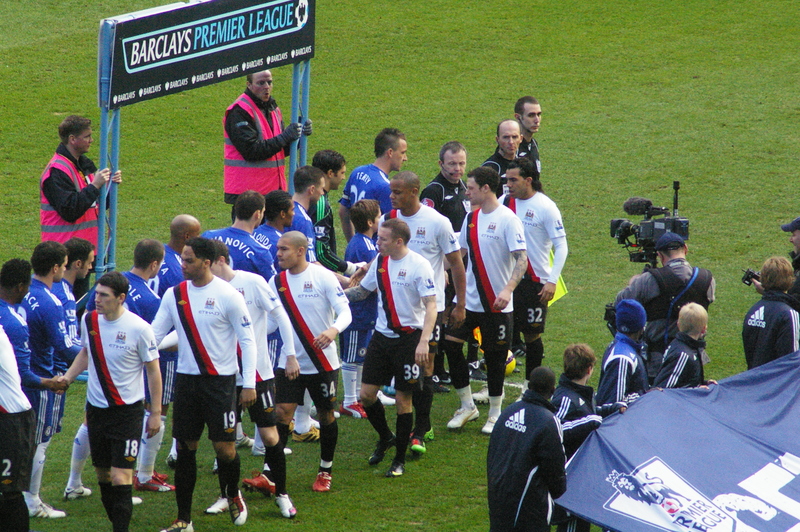 Chelsea vs. Manchester City : 27 February 2010. This hadn’t been a great week for me, what with missing out on the trip to Inter, then having to endure a gruelling time at work. I was so busy that I even forgot to book my own seat for the FA Cup game with Stoke. I was just happy for the weekend to finally arrive. I picked up Glenn at 8am and the two of us drove up to London. At times, the weather was rotten, but we still had a good old natter about work, football and everything. There would be a mini Californian get together for this game and I had already texted the three participants of my whereabouts and plans. Very often my mates will enquire of me “any Yanks coming over today, Chris?” I’m in a lovely position having got to know so many new Chelsea faces from America since my travels first took me to the US for the Roma game in Pittsburgh in 2004. Then, of course, there are these “Tales” which have become so much of my Chelsea routine over the past two years. I am a great diarist anyway, so these reports are second-nature for me…but I do wonder how long I can keep doing them. Maybe, in 2025, I’ll still be writing about our rubbish support at home games, making corny jokes, reminiscing over the past ( “of course, things were much better in 2005” and “of course, things were much better in 1984” ), lamenting our newest multi-million pound signing, talking about my CIA pals ( “is Gumby still in jail?” ), laughing at Lovejoy’s latest conquest and mumbling on ad infinitum about The Smiths and Depeche Mode. I wonder. Steve Azar was waiting for us at the cafe on Lillee Road at around 10.30am. There was no time to waste, so while Glenn and myself wolfed down a brekkie, Steve updated us with details of his trip to Italy. I approved of Steve’s classy Victorinox top. He had brought over a copy of The Sporting News baseball preview for me and we spoke of me being able to hopefully combine some baseball with the Chelsea games on the East coast in the summer. We popped into The Goose at just after 11am and we stayed for about an hour. The place was typically busy. A few mates arrived – Steve was able to meet Lovejoy and a few more of my friends, most of whom had been over in Milano. Everyone had reported back of a good time. The funniest story involved a mate “W” who had been stopped on his way through the airport in Milano – an Italian sniffer dog had molested him in searching for some contraband, and I just have images of all hell breaking loose. It seems the dog was all over him. You can just imagine how we all reacted, giggling with laughter, at this news. The saddest story from Italy involved my mate Neil who succumbed to a tummy bug on the Wednesday and – shades of Gumby – never made it to the match. Andy and Tom, in on a flying visit from LA, arrived at about 11.15am and it was great to see them again. We chatted about all things Chelsea, but these 12.45pm starts are killers for pre-match chats. Andy left early to get his flags up. Sky TV was on in the pub and I was really dismayed to hear a chorus of boos in the boozer greeting footage of Wayne Bridge getting off the team coach. I walked down to the ground with Tom and Steve, then bade them a fond farewell outside The West Stand. The three Californians – sitting in the fifth row of The Shed Upper – were soon spotted with my telephoto lens. Andy had got the three flags in and up on the balcony. I wasn’t so sure he would be successful with his two “OC Hooligans” flags. City only brought 1,500 away fans and I thought this was poor. Three flags, including one which stated simply “1910 Mancunian Purification.” I am guessing this was the date Manchester United left their stadium in Clayton, inside the city, out to Old Trafford in the then separate city of Salford. I’m afraid that I succumbed to photographing the entrance of John Terry and Wayne Bridge onto the pitch. I took several photos. In two photos, Wayne Bridge is glaring at JT. I guess he has every right to. I took a few photos of “the handshake that wasn’t” but evidence from my seat was inconclusive. I was saddened to hear boos each time Bridge touched the ball, but it was lovely to hear the volume decrease on every touch. Wayne Bridge will still be a Chelsea hero in my eyes and virtually all of my mates share the same view. Well, having seen over 500 games at Stamford Bridge, few were as mad as this one. The first-half was one-way traffic – albeit rarely getting out of second gear. Florent Malouda, still at left-back, had a lovely rising drive after eleven minutes. That boy can certainly strike a ball. Looking at the team line-up, I was convinced it was another 4-3-3, but Joe did pop up all the way along the front line. Mind you, so did Drogba and Anelka. Was it 4-3-3 or a narrow 4-4-2? Either way, the two full backs were pushing on. Ivanovic – the most improved player for me – sent over three magnificent crosses for Drogba, unmarked for two of them, and he should have tested Given. We were doing OK. The crowd was quiet, as is often the case with early starts. The Shed were especially docile. Joe had been quiet too, but then set Frank up with a sublime pass into space. A great finish, one-up and coasting. Hilario had only touched the ball three or four times the entire half, but after a poor attempted header by Mikel, Tevez sensed fear in the heart of our defence, twisting away from our two centre-backs. This defending was hapless and hopeless. The slightest of touches from Tevez and the ball crept over the line, past a floundering Hilario. How often do we hear the phrase “typical Chelsea”? The howls of derision from ghosts of previous defensive calamities echoed around The Bridge as the away fans – quiet beyond belief until then – rejoiced. We also witnessed a truly awful “Crossbar Challenge” – with Kerry Dixon on the pitch too – when five youths made pitiful attempts on the MH goal cross-bar. The second-half. Do I have to? We had good early pressure, but a wicked break from Bellamy ( with our defence out of shape ) caused us all to sense fear again. He’s a horrible bloke Bellamy, but has awesome pace. A cross-shot crept in to the goal at the far post and we all knew – 41,000 of us – that Petr Cech would have blocked it. Well, at last, the crowd was roused with some noise coming down from the stands. However, some substitutions confused us…I still thought we were losing the battle in midfield and wanted a change in formation. Boos when Joe was substituted, but I thought he had been poor again. Belletti came on, only to soon haul down Barry to give away a penalty. The break had again caught us out and he was sent-off. Oh hell. City scored through Tevez and I was so disappointed to see more than a few home fans get up and leave. Anelka had a lovely shimmy past two defenders down in my corner, but shot straight at Given. In fact, many of our shots went straight towards him. Then a preposterously stupid challenge by Ballack and we’re down to nine. Unbelievably, some fans around me were berating the ref for issuing the red, but he had no choice. That is not to say Dean didn’t have a poor game, but Ballack – already booked for dissent – was just bloody stupid to tackle in such a way. Ballack – and Frank – was having another poor game. It was a typical Ballack tackle…how often is he done for pace, then scythes a player down from behind? I was trying to remember if I had ever seen two Chelsea players sent off in the same game before. I think not. With Ballack’s dismissal, things got a whole lot crazier. We applied more pressure, but got caught on the break with SWP setting up their fourth. With this, hundreds of home fans decided to leave. I stood up, glowered at the ones leaving behind me and – OK, rather sarcastically – clapped them and said “thanks for your support.” One chap took exception and swore, only for one of Rousey’s mates to say something similar to him. He swore at Rousey’s mate, then looked back and repeated what he had said to me. Bizarrely, those that were left in the stadium, made a great racket and it pleased me no end. That was more like it – support in the face of adversity, no booing, good old-fashioned support. I was so pleased and proud to see that all of the regulars in our section who I have got to know since 1997 all stayed until the end. I was well pleased. Frank made it 4-2 with a calm penalty and there was a massive roar when “five minutes of extra time was announced.” We had all of the ball in those last few crazy minutes and it shows what a fantasist I am that I still expected us to draw. Oh, how I would have loved that, for the fans who had left early especially! As we exited at the end, we were met by my good mate Andy, always stoical in defeat. He made two great points. He thought that Chelsea fans were above booing former players. He also said that the 6,000 who left with ten or twelve minutes to go will be the ones moaning about not getting cup final tickets. For a change, Glenn and myself decided to have “a couple” before heading back to sleepy Somerset. We slowly walked over to join in with the post mortem taking place in “The Lillee Langtry,” over by West Brompton tube. I was still numbed by the defeat and unable to shed any light on the match. Sometimes, I sit back and let others talk. This was one occasion. The mood was gloomy, but we had seen it all before…”typical Chelsea” it had certainly been. Daryl was leading the analysis with some great points and we all eventually chipped in with some comments. We mused on how we had the world at our feet in the summer of 2005 – we appeared unstoppable. The players are now five years older, the team doesn’t have that same vigour. But – back in October, or November after Arsenal away, we were odds on to become champions again and so let’s not give up just yet. We have a tough road ahead, we have key players missing, the fallout of JT’s misdemeanours still haunts us. It will be a tough one, but it’s still in our own hands. With Glenn dozing, all of these thoughts – and many more – rattled around me on the drive home. I was sad to hear of Ramsey’s awful leg-break on the radio at Stoke…even more upset to hear Arsenal won. They have an easy run-in and are still in the mix. It’s not often I hate watching “Match Of The Day,” but this was certainly the case. I watched the highlights of our loss, grimacing…the John Terry handshake, the Bridge boos, the Ballack tackle, the fans leaving early…our first home defeat in 25 league games. God. Not a good day at the office. This entry was posted in Season 2009-2010. and tagged 2009-2010, John Terry, Kerry Dixon, Manchester City by Chris Axon. Bookmark the permalink.